Kazakhstan’s president identifies the most pressing task for this century. Kazakhstan is among those countries that had more reason than most to celebrate the end of the Cold War. The improvement in global relations and the end of Soviet control gave our nation the chance to chart our own future. It is an opportunity we have seized with both hands. It was also a time of hope that the mistrust which had divided our world would give way to a new era of peace, stability and co-operation. But the danger now, a generation later, is that this historic opportunity is being squandered. Wherever we look, there is growing instability, conflict and fear. International terrorism has grown, as Kazakh President Nursultan Nazarbayev said in Washington last month, from isolated acts to large-scale and coordinated aggression which threatens not just lives but the territorial survival of countries. Our world has failed to stop the spread of nuclear weapons, material and knowledge. The lead shown by Kazakhstan and a small group of other countries in the early 1990s in giving up our nuclear arsenals has not been followed. We now have the terrifying prospect of nuclear devices falling into the hands of violent extremists who would not hesitate to use them. International attempts to tackle these grave challenges have been thwarted by the re-awakening of tensions between the main powers. Instead of increased co-operation, we are seeing an increase again in proxy conflicts and trade agreements replaced by economic sanctions. It was against this background that Kazakhstan’s leader, in a strongly worded Manifesto, “The World. The 21st Century,” challenged his global counterparts last month to commit to peace and dialogue. Without such action, the president said the world was facing a real risk of plunging again into global conflict. Setting out a comprehensive program of action, Nazarbayev urged a series of inter-linked steps which must be taken to put the world back on track to a peaceful future. It was, he said, a Manifesto for a World without Wars. The president called for real progress towards arms reduction and the elimination of nuclear weapons which must be the final goal. These steps should include a global agreement to prohibit the deployment of lethal weapons in space, on the seabed and in international waters. This should be coupled, the Manifesto urged, with an outright ban on the development of new WMD. It is time to call a halt to the use of science for military purposes. He made clear that an important building bloc towards arms reduction would be to strengthen and extend existing peace and nuclear weapons-free zones. In particular, he said there was an urgent need for a new zone to cover the Middle East. Nazarbayev appealed, too, for the elimination of military blocs branding them as “relics of the Cold War.” Not only do they lead inevitably to the creation of a countering group, he said, but their protection can be abused by individual members to threaten neighbors and increase instability. Instead of reverting to old divisions, the president called for an intensification of efforts to defuse tensions and end regional conflicts. Disputes in the Middle East, Afghanistan, eastern Ukraine, the Korean peninsula and South China Sea all threatened global peace and security and needed urgent attention. Delivering such an agreement would be the best way to mark the UN’s 100th anniversary in 2045, the Manifesto suggested. 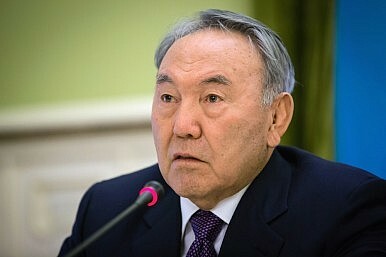 President Nazarbayev promised that, to help achieve this goal, Kazakhstan was ready to host an international conference this year where countries could re-affirm their support for international law as a way of preventing war and conflict. It is an ambitious agenda. But as President Nazarbayev said, there can be no more important or urgent goal than permanently freeing “humanity from the threat of deadly wars.” He was right to call it “the cause of the century.” It is the only sane response to the challenges we face and to place our world again firmly on the path to progress and peace. Erlan Idrissov is Foreign Minister of Kazakhstan.